Regular nitrogen generator maintenance ensures that your system continues to operate reliably, efficiently and with integrity. As with any system, maintenance is key to keep it running smoothly and to ensure consistent performance. Glaston engineers are trained in nitrogen generator maintenance, providing a reliable, professional nitrogen generator service that is unrivalled in the UK. As nitrogen is such a versatile gas, it has become increasingly popular in the food industry. Industry regulations state that companies must prove that the nitrogen used is fit for purpose. The most effective way to ensure that your company meets the British Food Retail standards is to document the correct servicing and maintenance of your equipment. This demonstrates that regular nitrogen generator maintenance is carried out and that all parts of the generator are checked and replaced if required. Glaston recommends that nitrogen generator maintenance should take place every six months. We offer maintenance contracts tailored to suit each of our clients. An effective nitrogen generator service schedule ensures your generator is producing high quality nitrogen and eliminates concers about contamination. Our nitrogen generator design and installation service offers our clients a service to design a suitable system tailored specifically to your requirements. 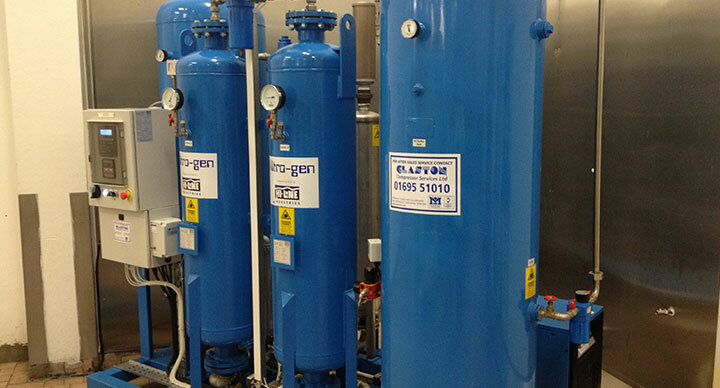 A nitrogen generator can be easily integrated with existing compressor systems. Glaston provides single source responsibility contracts to many of our clients whereby we manage, operate and maintain the air compressor systems for the entire facility/factory thus offering total reliability, service and cost benefits. For a quote or more information about our nitrogen generator maintenance services, please contact us today. If you’d like to speak to a professional about nitrogen maintenance, contact Glaston today. You can also speak to us about a range of services, including air compressors and vacuum blowers. We work with some of the most trusted names in the industry, including KAESER compressors and HPC compressors. What Is Involved In Nitrogen Generator Maintenance? Checking the overall operation of the generator to ensure its efficiency. Overhauling the inlet and outlet valves. If required, changing the Carbon Molecular Sieve. Changing the inlet filters that protect the nitrogen generator.